Xiaomi Redmi 5 features an immersive 5.7inch display. 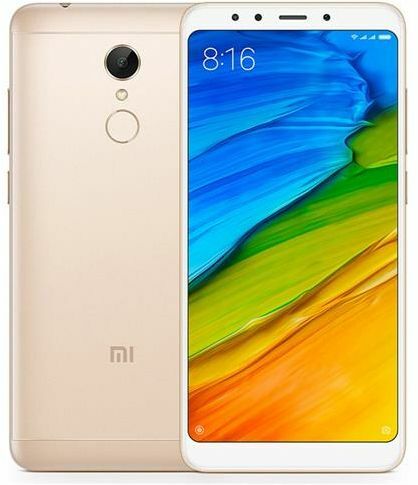 This Xiaomi dual-SIM smartphone has an aluminum back.The Xiaomi Redmi 5 Dual-SIM smartphone packs powerful performance in a compact design. It is driven by a Qualcomm Snapdragon 450 Octa-Core processor that delivers outstanding speed and efficiency for running multiple applications at the same time. This Xiaomi smartphone incorporates a 2GB RAM that provides high responsiveness for a smooth browsing experience. With an inbuilt memory of 16GB, the Xiaomi Redmi 5 provides sufficient space for storing your favorite entertainment content. The preinstalled Android 7.1.2 operating system offers a plethora of innovative apps for an intuitive user experience. This Xiaomi mobile is an excellent choice for photography. It is equipped with a 12MP rear camera that clicks stunning pictures with clearer details and sharper focus. Moreover, the 5MP front camera captures incredible selfies anytime of the day. This Xiaomi phone features a 5.7inch screen that delivers mesmerizing visuals to make your favorite movies and songs come alive. Available in a gold finish, the Xiaomi Redmi 5 exudes a beautifully sleek look. The Xiaomi Redmi 5 is engineered for breakneck performance. It features a Qualcomm Snapdragon 450 Octa-Core processor that uses leading-edge 14nm technology that ensures excellent speed and efficiency without draining the battery. This processor is designed to support cutting-edge camera capabilities and fast connectivity. Furthermore, the 2GB RAM gives this smartphone the responsiveness to handle multitasking without any glitches. This smartphone packs a powerful 3300mAh battery that offers an extended uptime, so you can enjoy uninterrupted entertainment without rushing to the charger. The phone has Android Nougat OS that provides a host of smart features that make your digital life easy and fun. With a responsive fingerprint sensor on the rear side, this phone leaps into action at your slightest touch. 97.1% of users recommend this product to a friend. Best phone you can get for the price.